Venue: Arusha, Dar es Salaam and Mwanza, Tanzania; Nairobi, Kenya; Kampala, Uganda; Lusaka, Zambia; Lilongwe and Blantyre, Malawi; Harare, Zimbabwe; Windhoek and Oshakati, Namibia; Mbabane, Swaziland; Maputo, Mozambique; Mahe, Seychelles. Payment Details: Total fee for the 2-year degree programme is US$ 8,840. Advance payment are made annually or per semester by arrangement. The fee covers tuition and limited materials. It does not include text books among other exclusions. MBA in Customs Management Programme is jointly offered by ESAMI and Centre for Customs and Excise Studies (CCES), Charles Sturt University, Australia. The programme is certified by the World Customs Organization (WCO). ESAMI and its partners recognize that without a critical mass of trained staff in customs management, Africa's customs performance will remain poor in spite of comprehensive reform programs. The MBA in Customs Management program is designed to progressively lead the students through a comprehensive course of study with specialization in customs management. This is achieved by way of a detailed analysis of the underlying principles and practices of customs management within the broader context of public sector management. The program is designed develop the knowledge of those undertaking the programme and to ensure that there is an appropriate level of skills transfer. The MBA Customs programme is offered in the evenings from 5:00pm - 10:00pm. Classes run for two to three weeks in every two and a half to three months. 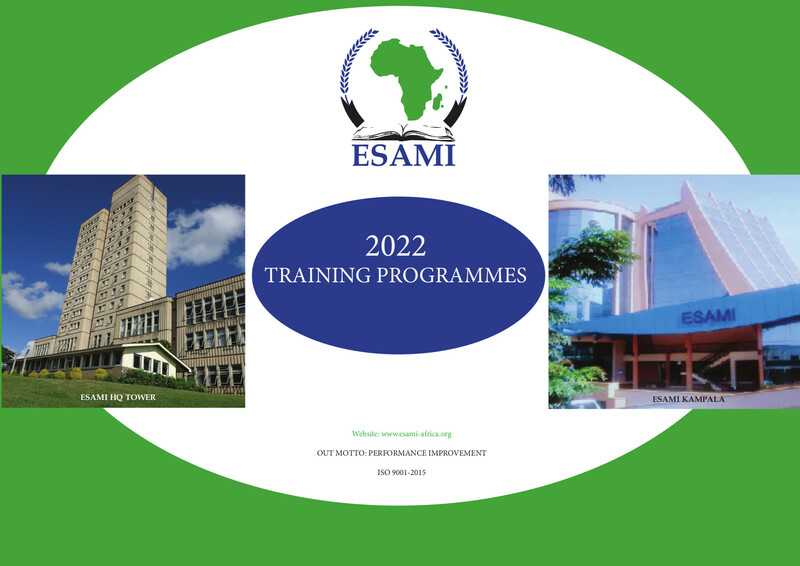 The MBA is offered in the ESAMI member countries in the following venues: - Arusha, Dar es Salaam and Mwanza, Tanzania; Nairobi, Kenya; Kampala, Uganda; Lusaka, Zambia; Lilongwe and Blantyre, Malawi; Harare, Zimbabwe; Windhoek and Oshakati, Namibia; Mbabane, Swaziland; Maputo, Mozambique; Mahe, Seychelles. Total fee for the 2-year degree programme is US$ 8,840. Advance payment are made annually or per semester by arrangement. The fee covers tuition and limited materials. It does not include text books among other exclusions.